Generates a storm of fire around the caster. A spell mimicking the raw power of the Dragon God, Sultan of Chaos. Its devastating flame is impossible to control. The most powerful area of effect spell. Creates numerous pillars of fire around the caster. Mid range; pillars can appear a good distance away from the caster. If an enemy strikes the caster, the spell will be interrupted. Damage is progressive. 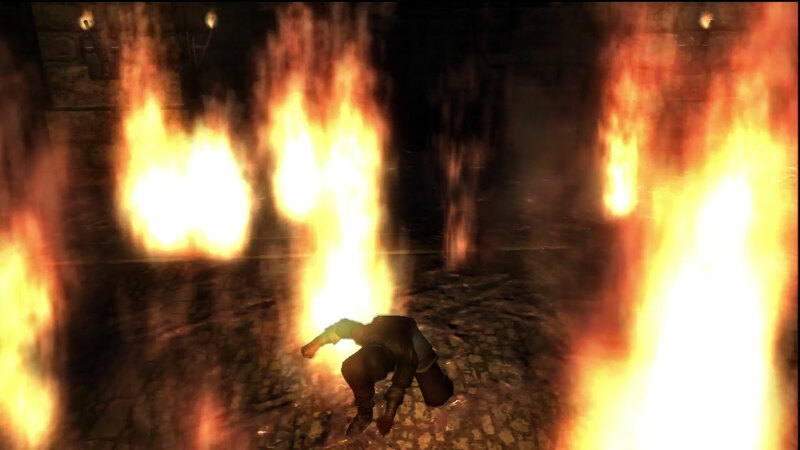 Enemies take damage as long as they are exposed to the flames. NPC and player-controlled Black Phantoms will be knocked out of the flames. Works well on most bosses; Generally, three casts is enough to kill any boss that is not fire-resistant. Works well for the 2-2 Crystal Lizards nest. The White Bow Black Phantom uses this spell. Firestorm is a very effective spell in both PvE and PvP. In PvE with a high Magic stat, the majority of enemies will die to one cast of Firestorm, as well as fire-weak bosses. Even normal bosses can be defeated with a few casts. Firestorm is also commonly used in PvP; though opponents are knocked out of the flames, even short exposure to Firestorm can deal upwards of 1000 damage or more. Two strikes in one Firestorm are also possible in enclosed spaces, though since opponents are knocked a fair distance away, it is uncommon. Still, the knockdown effect is useful. The main disadvantage of Firestorm is that it's unreliable. The pillars of flame sprout randomly; they may first appear to any side of the caster, and from anywhere in the spell's range. Eventually, the spell will achieve the full area of effect, but this takes a few seconds. For this reason, fast-moving opponents can close the distance and strike the caster before Firestorm reaches full power, interrupting the spell and leaving the caster vulnerable and with 100 less MP. Firestorm must be used with caution and not relied upon too heavily.